Marodyne LiV is a bio-mechanical vibration treatment system which provides a gentle, yet highly effective, stimulus for muscles and bones. Its action is designed to build up bone mineral density as well as strengthening the muscles and providing postural stability. It is easy-to-use, safe and effective. Low intensity vibration (LIV) treatment was developed by Professor Clinton Rubin of Stony Brook University, New York. His unique method delivers a very small mechanical vibration to stimulate a natural reaction in the body by delivering a very precise signal to activate the bone and muscle cells. This replicates the natural signals produced by health mass in the body. People who are young and active, with a healthy muscle mass, create signals that are strong enough to stimulate these cells. However, people who are older, inactive or have poor muscle mass, have muscles which produce a different type of signal that isn’t able to stimulate the cells. Marodyne LiV remedies this by replicating the precise signals of young and healthy muscle at the right level to effectively stimulate the cells. As we age the faster the type II fast twitch fibres that are essential for stimulation of bone cells (10-50Hz range) decline proportionately. This can lead to greater musculoskeletal instability and an overall poorer quality structure. Marodyne LiV with its low intensity vibration acts as a replacement for the lost muscle fibres and replicates the small high frequency forces to assist with musculoskeletal health. Physical activity, sport and exercise are a fundamental part of treatment for osteoporosis as they build strength, improve posture and help with falls prevention. There is a close connection between our bones and muscles which work together to support us, give us strength and allow us to move. People with osteoporosis can gain significantly from exercise to promote good mobility, strength, coordination and speed of reaction. The latter two are crucial: after all, strength is not much use if a person lacks coordination or can’t respond quickly enough to a falls risk. Exercise has a key role to play too. Physical activity strengthens muscles and develops stability, balance, a steady gait and a sense of equilibrium. Strength gives us good posture and allows us to keep active while a steady gait and sense of balance help us walk and stand with ease and minimise our risk of falling over. Falls present a very high risk of hospitalisation and are a leading cause of premature death to people with osteoporosis and should be avoided at all costs. Falls are the main cause of fractures in older people and a primary reason for hospitalisation: if you reduce your risk of falling, you greatly reduce your risk of breaking your delicate bones. Appropriate strength training is therefore recommended as part of osteoporosis treatment. You don’t have to join a gym or take up boxing but you should look to exercise a little each day to enjoy the benefits. Walking, swimming and running are all excellent forms of exercise as are playing tennis or badminton. 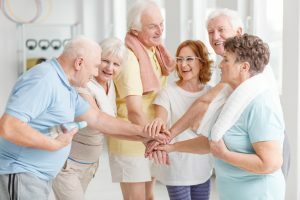 Many leisure centres have low impact classes for people who need a gentler form of exercise and many have specific classes for falls prevention. The secret is doing a variety of activities, little and often. Marodyne LiV is the perfect was to compliment your muscle building exercise with it’s bone building therapy.